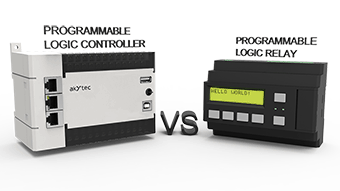 Programmable Logic Controller (PLC) is a special purpose small computer primarily used in industries or any other field related to control systems. The modern PLC is a device of high performance and protection against high levels of electrostatic discharge (ESD), large transient voltage swings, electromagnetic interferences (EMI), etc. The latter enables the device of this kind to operate in harsh conditions. Most PLCs are equipped with a wide range of network interfaces, such as RS485, Ethernet, CAN, LVDC, etc., and related communication protocols, e.g. Modbus, Profibus, CANopen, EtherCAT, DeviceNet, EtherNet I/P, etc. The PLC is no longer limited to one programming language. It can be programmed with any of 5 languages – Function Block Diagram (FBD), Instruction List (IL), Ladder Diagram (LD), Sequential Flow Chart (SFC) and Structured Text (ST) – which are compatible with the international standard IEC 61131 for programmable logic controllers. Some PLC’s programming environments allow the developer to flexibly mix and match different programming languages in one CPU. Moreover, modern programming environments, e.g. CODESYS V3.5, support for different data types, visualization elements, extensive libraries, Object-oriented programming (OOP) paradigm, OPC UA, etc. Due to such comprehensive software capabilities and considerable memory capacity, complex and large projects on process control for almost any industrial purposes can be implemented using a PLC. Such high performance is not needed when efficiency has a much higher priority. Consequently, many manufacturers have started manufacturing more simplified devices dubbing them 'Programmable Logic Relay' (PLR), 'Compact PLC', 'Mini PLC', 'Smart Relay', ‘Small Controller’, etc. The devices of this kind are usually not modular and feature less memory capacity, fewer interfaces/protocols and fewer I/O points, which makes them more compact and cost-effective. A PLR is generally, at the minimum, as twice as less expensive than a PLC. Another advantage of PLRs is substantial savings in time of their programming because they usually come with an intuitive and easy-to-use programming environment. As a result, the required user program can be developed without involving high-paid programming developers. The akYtec GmbH does not stand aside from this trend and also offers PLR-like devices, such as Programmable Relays of PR1XX seriesand a more sophisticated device of this kind – PR200. They all are equipped with Real-Time-Clock and can be expanded with I/O-Modules. With the user-friendly and free of charge programming tool akYtec ALP, you can create simple and effective solutions for many industrial needs, such as pump control, lighting, HVAC, home automation, and other simple automation tasks, with no need of a complicated and expensive PLC. How to display the contents of Modbus registers on the LCD of the PR200 mini PLC as text?